Hello everyone! It’s Monday and let’s just say I’m moving a bit slower then normal. Over the weekend on top of working Chris and I both spent time with our families and phew I’m exhausted. Luckily though today I’m working from home. Meaning my outfit could either consist of pajamas or casual athliesure. Lately I can’t get enough of my pink sneakers so today I thought I would share 3 outfit to wear with pink sneakers. The first outfit is one of my favorites! It’s the perfect everyday athletic outfit if you ask me. 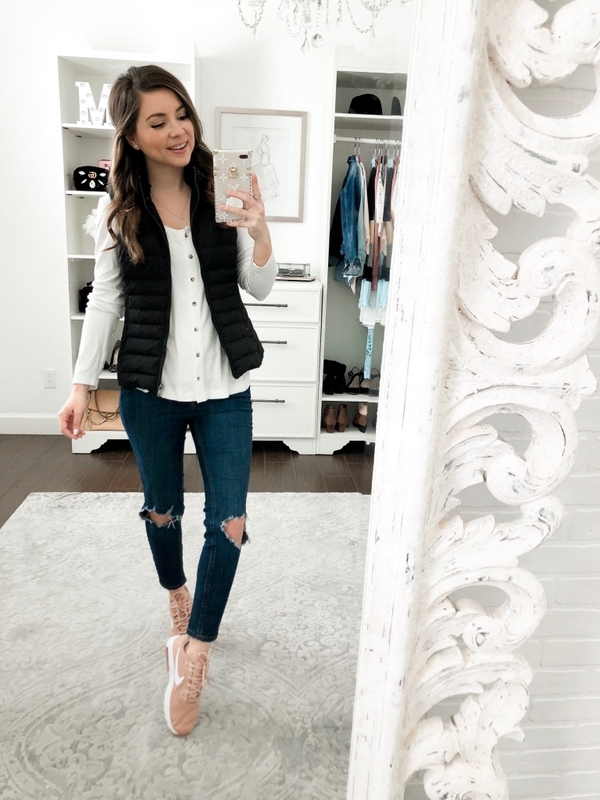 Take your favorite pair of high waisted leggings add a henley or button down top like the one I’m wearing then to finish of the look the cutest pink sneakers. The leggings I’m wearing are ones that I got from the Nordstrom Anniversary Sale last year but they are still available in some sizes. When it comes to the fit I went with my normal size x-small. 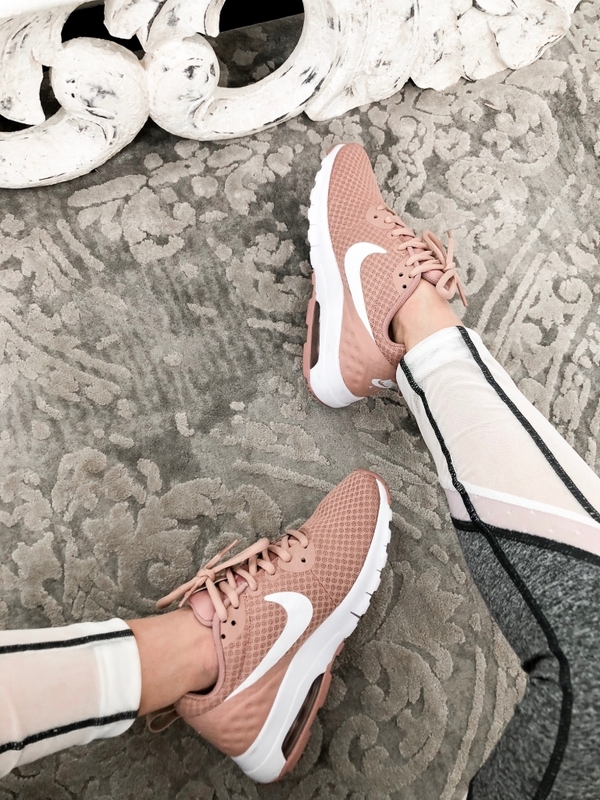 These pink sneakers are absolutely comfy! They are also lightweight which makes them even better! When it comes to sizing I stayed with my normal size since these run (TTS) true to size. Does anyone else own a lot of graphic tees and sweaters? Or is it just me? 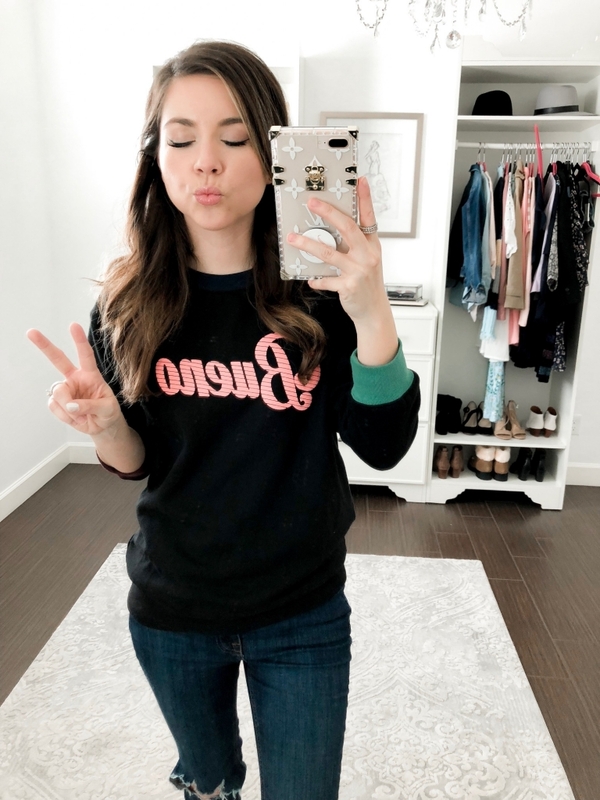 This great company just sent me this Bueno sweater and I had to share it with you all! You can get it HERE! All you need for this look is a graphic sweater and a great pair of ankle jeans. I find that wearing ankle jeans or cuffing jeans above the ankle give the entire outfit a bit more polished look when wearing sneakers. 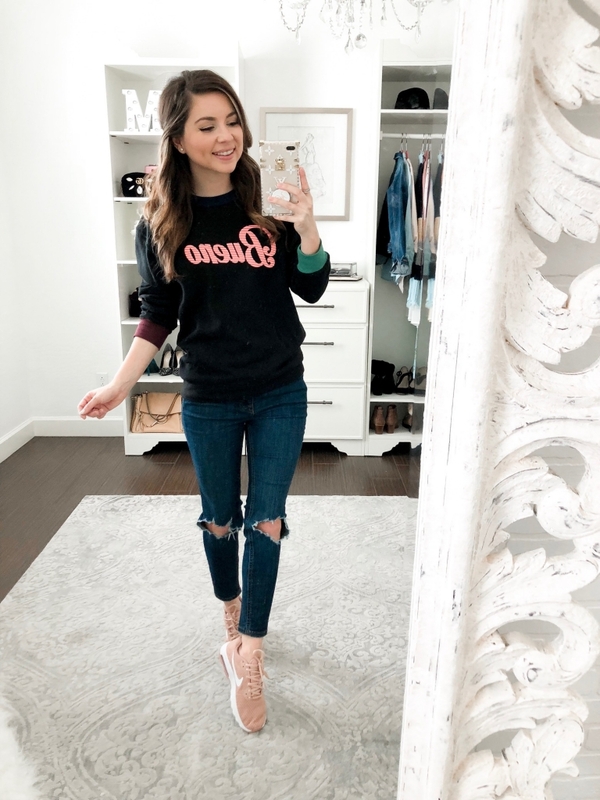 PS I’m wearing this sweater right now as I’m writing this post! The last look I have for you when it comes to wearing pink sneakers is this quick everyday look. I have on the same jeans on as well as the same white button up from above then simply added a puffer vest. Isn’t great when you have pieces in your wardrobe you can mix and match easily? I wore this outfit last weekend when Chris and I went grocery shopping and it was perfect. It’s always so chilly in those freezer sections? Or it might be because I spend too much time in the ice cream isle! Anyways I love this pink sneaker outfit as well. Needing a pair of pink sneakers for yourself? I went ahead and linked a few more options for you below! When I was linking them I thought I maybe could need another pair! I hope you all had a great weekend and are excited for a new week! I have my list ready to go and I am going to try to stick to it so that I can have time at the end of the day to finish my book.